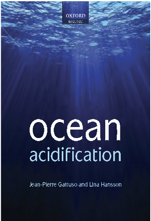 Elevated atmospheric CO2 concentrations are contributing to ocean acidification (reduced seawater pH and carbonate concentrations), with potentially major ramifications for marine ecosystems and their functioning. Using a novel in situ experiment we examined impacts of reduced seawater pH on Antarctic sea ice-associated microalgal communities, key primary producers and contributors to food webs. pH levels projected for the following decades-to-end of century (7.86, 7.75, 7.61), and ambient levels (7.99), were maintained for 15 d in under-ice incubation chambers. Light, temperature and dissolved oxygen within the chambers were logged to track diurnal variation, with pH, O2, salinity and nutrients assessed daily. Uptake of CO2 occurred in all treatments, with pH levels significantly elevated in the two extreme treatments. At the lowest pH, despite the utilisation of CO2 by the productive microalgae, pH did not return to ambient levels and carbonate saturation states remained low; a potential concern for organisms utilising this under-ice habitat. However, microalgal community biomass and composition were not significantly affected and only modest productivity increases were noted, suggesting subtle or slightly positive effects on under-ice algae. 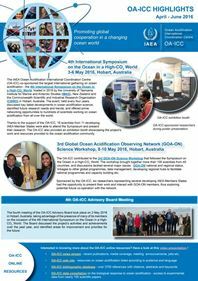 This in situ information enables assessment of the influence of future ocean acidification on under-ice community characteristics in a key coastal Antarctic habitat. The carbonate system is a vital buffering system that controls the pH of seawater and maintains a healthy environment for marine organisms. As concerns regarding the fate of anthropogenic CO2 in the oceans are rising, it is becoming increasingly urgent to systematically quantify and understand this system’s parameters, particularly in heavily human-impacted areas, such as the Mediterranean Sea. To date, the paucity of time-series stations adopted to monitor the carbonate system in this sea has precluded characterizing the region at an adequate spatial resolution. Here, we present and study the seasonal and annual variability and drivers of the first carbonate system dataset collected for the Lebanese waters, monthly at the upper 80 m between 2012 and 2017 in two time-series stations offshore the North of Lebanon-Levantine Sub-basin, Eastern Mediterranean Sea. Annual trends were calculated for the non-adjusted and the adjusted carbonate system parameters (an adjustment that reduces the influence of simple-dilution-concentration [SDC] processes on the trends). Our results show high carbonate system inventory [total alkalinity (AT), total dissolved inorganic carbon (CT), and pH] compared to other Mediterranean areas. The obtained trends reflect increasing rates for both AT and CT, only significant at surface for CT(+5 ± 2 μmol kg−1.yr−1; p < 0.05). Whereas annual acidification rates were always significant (i.e. from −0.009 ± 0.004 to −0.0021 ± 0.001 pH units.yr−1at 0 m and in the upper 80 m respectively for pHT25adj). Concomitantly, decreasing trends of the saturation states for both CaCO3 minerals were calculated (−0.1 ± 0.04 and −0.07 ± 0.02 yr−1 for calcite and aragonite respectively at surface; p < 0.05). Moreover, our results showed that SDC processes, together with CO2 release/invasion and the active overturning circulation, are controlling this system in the Lebanese seawater, Eastern-most Mediterranean Sea. Contrariwise, the increasing trend of total alkalinity, mainly attributed to SDC processes (i.e. riverine inputs, weathering during extreme events, precipitations), may be buffering the observed acidification rate, which could have been worst in case AT in our area was lower. The North Atlantic is one of the major sinks for anthropogenic CO2. In this study, we investigate the evolution of CO2 uptake and ocean acidification in the North Atlantic Subpolar Gyre (50° N–64° N) using repeated observations collected over the last three decades in the framework of the long-term monitoring program SURATLANT (SURveillance de l’ATLANTique). Data obtained between 1993 and 1997 suggest an important reduction in the capacity of the ocean to absorb CO2 from the atmosphere during summer, due to a rapid increase in the fugacity of CO2 (fCO2) in surface waters (5 times faster than the increase in the atmosphere). This was associated with a rapid decrease in surface pH (of the order of −0.014/yr) and was mainly driven by a significant warming and increase in DIC. Similar trends are observed between 2001 and 2007 during both summer and winter with a mean decrease of pH between −0.006/yr and −0.013/yr. These rapid trends are mainly explained by a significant warming of surface waters, a decrease in alkalinity during summer and an increase in DIC during winter. On the contrary, data obtained during the last decade (2008–2017) show a stagnation of surface fCO2 (increasing the ocean sink for CO2) and pH. These recent trends are explained by the cooling of surface waters, a small decrease of total alkalinity and the near-stagnation of dissolved inorganic carbon. Overall our results show that the uptake of CO2 and ocean acidification in the North Atlantic Subpolar Gyre is substantially impacted by multi-decadal variability, in addition to the accumulation of anthropogenic CO2. As a consequence, the future evolution of air-sea CO2 fluxes, pH and the saturation state of surface waters with regards to aragonite and calcite remain highly uncertain in this region.